In this chapter, you'll learn how to master Symfony2 forms with Propel. If you want to follow along with the example in this chapter, create a LibraryBundle bundle by using this command: php app/console generate:bundle --namespace=Acme/LibraryBundle. In Symfony2, you deal with Type so let's create a BookType to manage our books. For the moment, just ignore the relation with Author objects. Every form needs to know the name of the class that holds the underlying data (e.g. Acme\LibraryBundle\Model\Book). Usually, this is just guessed based off of the object passed to the second argument to createForm(). To quickly explain how forms are rendered, the controller above extends the Controller class which provides the render() method used to return a Response but this is not considered as a best practice. It's better to create a controller as a service. handleRequest has been introduced in Symfony 2.3. Be sure to use bindRequest instead in previous versions of Symfony. 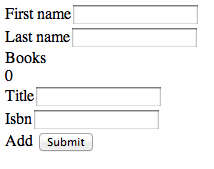 As you can see, this is really easy to manage basic forms with both Symfony2 and Propel. But, in real life, this kind of forms is not enought and you'll probably manage objects with relations, this is the next part of this chapter. 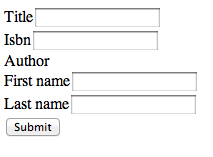 When the user submits the form, the submitted data for the Author fields are used to construct an instance of Author, which is then set on the author field of the Book instance. The Author instance is accessible naturally via $book->getAuthor(). When you'll create a new Author object, you'll be able to add a set of new Books objects and they will be linked to this author without any effort thanks to Propel and specific methods to handle collections on related objects. Now, imagine you want to add your books to some lists for book clubs. A BookClubList can have many Book objects and a Book can be in many lists (BookClubList). This is a Many-To-Many relation. You've added a CollectionType for the Book list and you've configured it with your BookType. 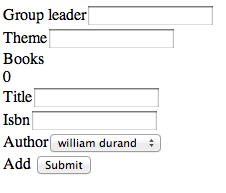 In this example, you allow to add and/or delete books. The parameter by_reference has to be defined and set to false. This is required to tell the Form Component to call the setter method (setBooks() in this example). In the previous example, you always create new objects. 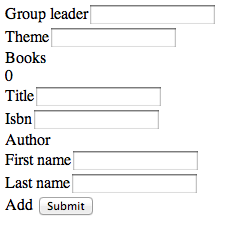 If you want to select existing authors when you create new books, you'll have to use a Model type. You can change the text wich be displayed by passing the property argument. If left blank, the __toString() method will be used. The ModelType is part of the Symfony Propel Bridge. Using Propel in a Symfony2 project lacks a convenient way to use validation through annotation. Instead you have to use classic validation process, using a validation (in yml, xml or php format) file. In order to use this type of validation you must configure your application. Now just follow the official documentation about validation to know how to create your validation file. As Doctrine has his UniqueEntity constraint, Propel has its UniqueObject constraint. The use of this constraint is similar to the use of the UniqueEntity. message: User already exists (). As many validator of this type as you want can be used. The Symfony2 Form Component doesn't have anymore secrets for you and to use it with Propel is really easy.